Dr. McLean’s sentiment is not uncommon. It seems that everyone is busy. So how can health care leaders responsible for quality and safety break through that barrier? The Institute for Healthcare Improvement (IHI) notes that most hospitals struggle with engaging physicians in quality and safety improvements.1 To help organizations such as Duke increase engagement, IHI outlined an easy-to-follow framework with suggestions that include discovering a common purpose (e.g., improved patient outcomes), involving physicians from the beginning, making quality improvement (QI) easy, and valuing physicians’ time. Other engagement methods discussed at the meeting included embedding QI in training programs, identifying QI champions, establishing quality councils, providing coaching, making physician involvement visible, and communicating often. When an interest in improving care is not enough motivation for physicians, some organizations institute peer recognition. Mimi Saffer, Vice President, Quality Improvement and Quality Measurement, at the Children’s Hospital Association, says recognition can be at the institutional level, health system level, unit level, and individual level. “Clearly, what the Board has done with MOC Part 4 credit is at a very personal level of recognition,” she says. Francis Rushton, MD, a private practitioner representing the South Carolina Chapter of the American Academy of Pediatrics, agrees. He uses MOC as a “carrot” to engage physicians to participate in his South Carolina Medicaid project. “MOC has been a huge boon to us,” he says. Other institutions have found that financial rewards work best. For example, Children’s Mercy Kansas City gives a Patient Safety award to recognize an individual or group of individuals who have worked tirelessly to improve the safety of patients and eliminate harm. Recipients receive a plaque and a small stipend during a formal annual faculty awards event. The Children’s Advisory Board at St. Luke’s Children’s in Idaho gives $100,000 in quality and safety grants to at least 20 individuals annually. And Duke University’s Department of Pediatrics offers a travel grant to support individuals who are invited to give a presentation at a national conference about their quality improvement project. 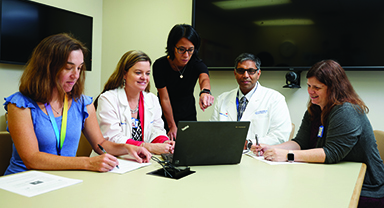 In the past few years, Duke’s Department of Pediatrics has seen a leap in quality work and improved clinical outcomes. “We’re trying very hard to get all of the incentives to line up properly,” says Dr. McLean. 1 Reinertsen JL, Gosfield AG, Rupp W, Whittington JW. Engaging physicians in a shared quality agenda. IHI Innovation Series white paper. Cambridge, Massachusetts: Institute for Healthcare Improvement; 2007. Available on www.IHI.org. Accessed February 1, 2019.